This nice little laptop is one of the first real IBM PC compatible laptops featuring large LCD display (80x25 here) and true compatibility. This machine has two 720KB Floppy drives (and no hard drive). It boots from one floppy drive (DOS) while the 2nd floppy is used for data and programs you may wish to run. It has a NEC V20 8-bit processor which is switchable between 7.16 MHz and 4.77 MHz. It also has a CGA backlit LCD screen (monochrome), optional built in modem (1200 baud), math coprocessor and standard serial and parallel ports. It also has a DB-9 CGA port and RCA composite port for use with an external display. There are LED indicators for Caps Lock, Num Lock, Low Battery, Scroll Lock and Standby Mode. Special features (for the time) includes battery-powered clock & calendar, standby mode and internal speakers. The first member of the 1400 serie is called the LT. The FD and HD models were released later (1988?). The FD having two 3.5'' disk drives and the HD one 3.5'' disk drive + one built-in hard disk (20 MB). 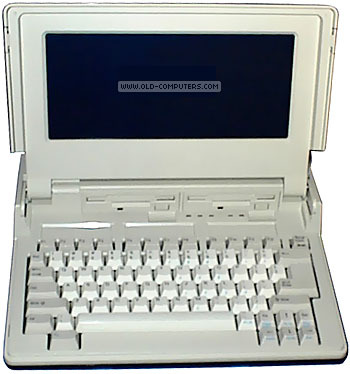 The only differences between LT and FD model are : FD has an external floppy drive connector, no composite video output and only one internal slot (for modem). The case is almost identical though the FD is lighther. The HD is an FD model with a 20 MB hard drive built-in instead of the 2nd floppy drive. The LT was delivered with Tandy DOS 3.2003 or 3.2004, and the FD & HD with Tandy DOS 3.3004.
see more Tandy Radio Shack 1400 LT/FD/HD Ebay auctions !